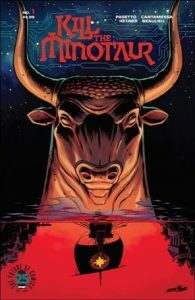 A modern and outlandish take on the ancient Greek myth of Theseus and the half-man, half-bull creature the Minotaur, Kill the Minotaur still sees Theseus venturing to King Minos’ Labyrinth as he did in the original story, but he must face off against a much larger and more fearsome Minotaur. With a fantastical setting and world-threatening designs dreamt up by the human sacrifice-devouring Minotaur, the series is both brutal and beautiful. The comic hails from Christian Cantamessa, one of the writers who worked on Rockstar Games’ Western action-adventure title Red Dead Redemption, and Chris Pasetto, who co-wrote the Skybound-produced film Air, which Cantamessa directed. Lukas Ketner and Jean-Francois Beaulieu share art credits on the comics series.